What can an institutional research leader do to ensure their unique roles do not place them or their institution in a legally challenging situation? In this monograph, IR practitioners, legal counselors, and scholars combine their expertise to examine unique legal challenges IR professionals face, offering guidelines for operating within legal boundaries and sustaining effective IR practices. how accreditation may change from voluntary to a contractual or even constitutional protections effort. This is the 172nd volume of this Jossey-Bass quarterly report series. Timely and comprehensive, New Directions for Institutional Research provides planners and administrators in all types of academic institutions with guidelines in such areas as resource coordination, information analysis, program evaluation, and institutional management. Matthew Fuller, PhD, is an associate professor in the Higher Education Leadership department at Sam Houston State University. 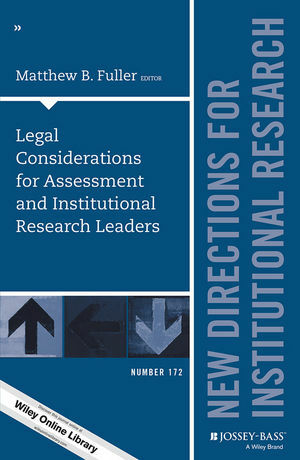 Chapter 1 offers a framework for using legal case precedents as a guideline for assessment and institutional research practices and policies. Chapter 2 covers the historical contexts, recent developments, and common misconceptions of The Family Educational Rights and Privacy Act. Chapter 3 outlines threats IR staff face to securely storing and managing data, offers advice on hiring third party vendors, and describes precautions and responses to data breaches. Chapter 4 offers insights into employment, harassment, and intellectual property laws institutional research leaders may face in supervising staff members. Chapter 5 considers the extent to which knowledge of specific student performance or concerns creates an institutional liability. Chapter 6 reviews the purpose, history, and process of accreditation and provide possible developments in the future of how accreditation will be considered by courts. Chapter 7 reflects upon ways in which data and rhetoric of assessment might create potential student causes of action. Chapter 8 synthesizes the concepts offered in the monograph and offers advice on enlisting the support of other colleagues to support effective institutional leadership.